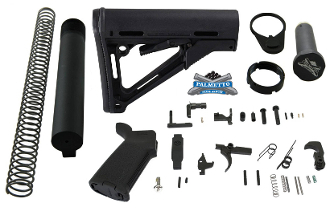 Palmetto State Armory CTR AR-15 Mil-Spec Lower Build Kit. Complete kit with premium quality components to finish your stripped lower receiver. Palmetto State Armory Mil-Spec 6-Position Premium 7075 Buffer Tube Assembly. Please Note: Buffers may vary in appearance depending on product batch from PSA. They may or may not be black anodized with logo.